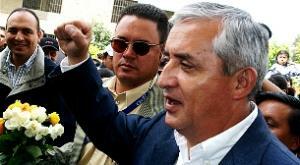 Guatemalan President Otto Perez Molina said Wednesday his country could present a plan before year's end to legalize the production of marijuana and opium poppies. His comments came in an interview with Reuters. Perez, a conservative and former general, has been a harsh critic of the US-led war on drugs in Latin America, repeatedly denouncing such policies at international forums. He has also previously mentioned the possibility of moving to legalize marijuana and opium production, but has yet to put forward a concrete plan to do so. But a presidential commission has been studying the issue of reforms in the country's drug laws, and Perez told Reuters he expected the commission to make its recommendations by October and that the measures could be presented by year's end. That could include a bill to legalize drugs, particularly marijuana, Perez said. "The other thing we're exploring... is the legalization of the poppy plantations on the border with Mexico, so they're controlled and sold for medicinal ends," Perez said. "These two things could be steps taken on a legal basis." While Afghanistan is by far the world's largest opium producer, accounting for nearly 90% of global production, poppies are also grown in the Western hemisphere -- in Mexico and Colombia, as well as Guatemala. Western hemisphere opium accounts for most of the heroin consumed in the United States. If they agree not to cause society any problems, and keep to the agreement, they can have their drug legally at actual market price + a reasonable tax, preferably a tax based on ability to pay, and maybe distributed through public health authorities.That would be one helluva way to give them an incentive not to cause society any problems, and to take away most of the revenue of the cartels and local dealers, who both cause so much havoc. Only the real hardheads would be left to deal with, they won't have a sea of phony criminals to swim in anymore, and there would be plenty of freed up jail cells and other resources available to deal with them. Thank you for this story. The discussion of poppies is...interesting. In view of the fact that medicinal opium prod'n is currently limited only by legal quotas, what does he expect? That medicinal use of natural & semi-synthetic opiates is going to increase? It probably should increase somewhat, in that more people should be getting more of them for pain, with a concomitant reduction of less-safe analgesics, but I don't think the up-side potential there is huge. Therefore it would have to be a sly way of getting it into the recreational market.